The ‘big day’ arrived. 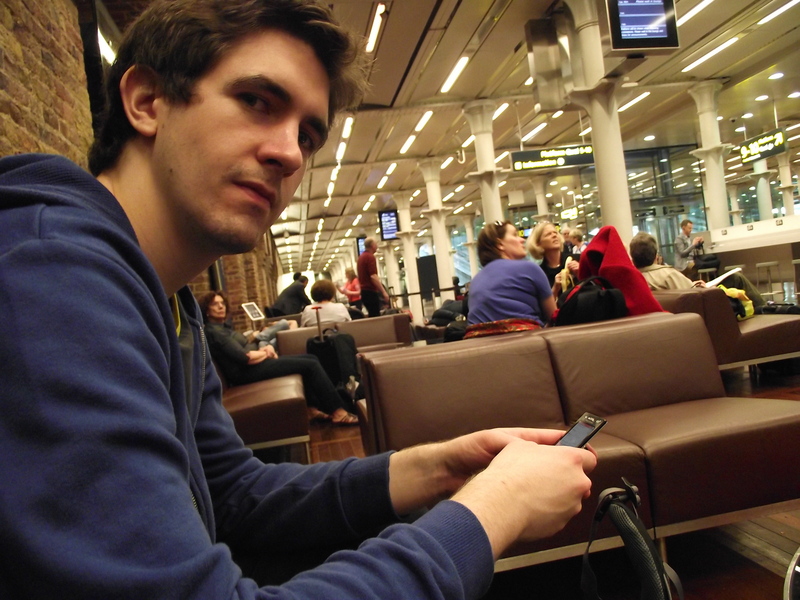 David and I met at Basingstoke station at an horrifically early hour. The adventure began well with the discovery that it would cost us £10 less to get to London than it would to get from London to Brussels. On arrival at St. Pancras station we had the time to treat ourselves to a cup of tea, our last before hitting the continent. We found ourselves sipping on a cup of scalding hot beige with the hope that in Europe they could, at the very least, do better than this. Over the loudspeaker it was announced that our train was ready and we headed out towards our carriage, stopping momentarily so I could be a good citizen and help an elderly lady load her bags onto the train. Industrial East-London faded into the Garden of England before we were plummeted into darkness.The train emerged into the lush greens of Northern France before it raced on into Belgium. 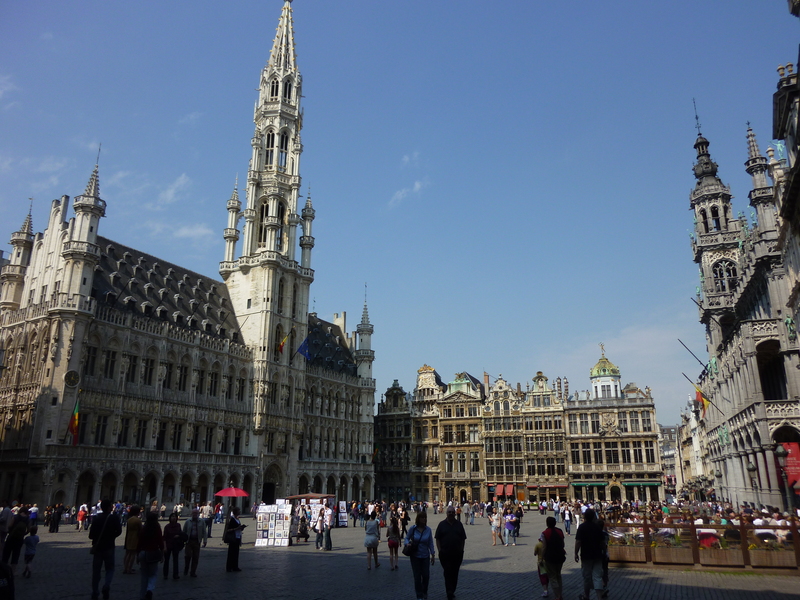 The first thing I noticed in Brussels, and then constantly in every Belgian city, was the smell; first a wave of urine and then occasionally through out the day, as a reminder of where we were, the subtle hint of raw sewage. This lead us to our first rule of Belgium; it doesn’t matter what it looks like, just so long as it smells awful. The Belgians seem to have no problem with this, they live with it and so would we. On the walk from the station to our first hostel, both Dave and I realized two things. Firstly, we’re incredibly unfit; secondly, we had far too much with us. We arrived at our base for the next two days: 2Go4 Hostel. A small and rather pleasant place a short walk from the city centre. We dropped our stuff, made our beds and headed back out into Brussels to discover what it had to offer two former students from England. The need for food is our first tour guide and we browse a few menus before taking seats in front of a cafe I know only as Stella Artois. The first beer of the journey made us wonder what is wrong with Britain, why are we so tolerant of awful lager? David and I ordered some food, a half chicken and steak tar-tare respectively. A half chicken in Brussels is exactly what you would expect; half a chicken. Steak tar-tare on the other hand is a combination of raw mince, raw egg and onion, very unusual and I am informed that it is a Belgian delicacy and I am more than happy for them to keep it that way. The rest of the afternoon was spent walking around the city before finding a park in which to enjoy the last of the day’s sunshine. When the sun finally disappeared behind the abstract skyline we headed back once more into the city to find more beer. The next morning we awoke, although it didn’t feel like we had been to sleep. A combination of over-whelming heat and the constant flow of traffic had made it difficult to sleep until the morning. This didn’t stop us from heading out with most of the day ahead and we began at a comic museum. Belgium, as I’m sure you’re well aware is famous for Tintin and there was a lot of Tintin in this museum, but pleasantly there was also a lot more. Did you also know that the Smurfs were originally created by a Belgian? I found the collection of single panels from comics particularly interesting, despite the fact that I couldn’t understand any of the jokes and it was a pleasant surprise to find a page from the Amazing Spiderman in English among the absurd foreign pieces. From the comic museum we met up with our old tour guide, hunger, and we were lead to a restaurant offering steak and chips for less than 10 euros, we don’t hesitate to tuck in! The meal is followed by the hunt for Belgium’s other claim to fame; the E.U. What we found was perhaps the most impressive example of contemporary architecture I have ever seen. A cold exterior of glass and steel makes the European Parliament look incredibly dominant. We took a break from our travels behind the buildings and watched what we assumed to be an MEP shoot some hoops on the oddly placed basketball courts. The decision was then made to find a supermarket to purchase a dinner of champions; baguettes, camembert and chorizo. This was washed down with an unsuccessful attempt to find the Atomium, Brussels final claim to fame, which was a resounding failure and was quickly replaced with a journey to find some cheaper beer. Another restless night followed by a morning of glorious sleep was disturbed by the need to check out of the hostel and retain our deposit. We headed off to the station and made our first use of the inter-rail passes, which appeared to be pretty redundant as there were no ticket barriers and, despite sitting across from three guards, went unchecked. The train journey remained largely uneventful apart from the passing of an abandoned station in the centre of Brussels, not quite as terrifying as an abandoned theme park but daunting none the less. 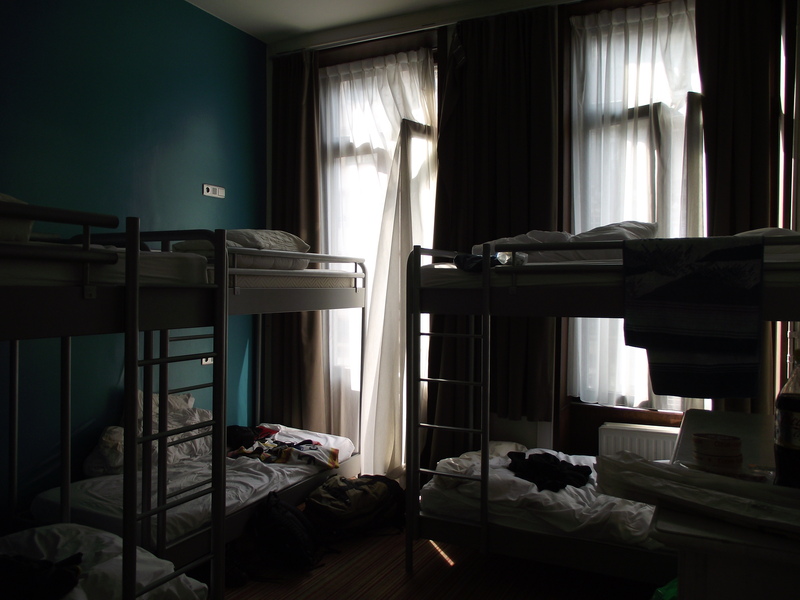 The hostel in Bruges, which was unpronounceable and therefore un-type-able, was like a place you would find on a school trip. An open field at the front, a small patio area with picnic tables and two table tennis courts. 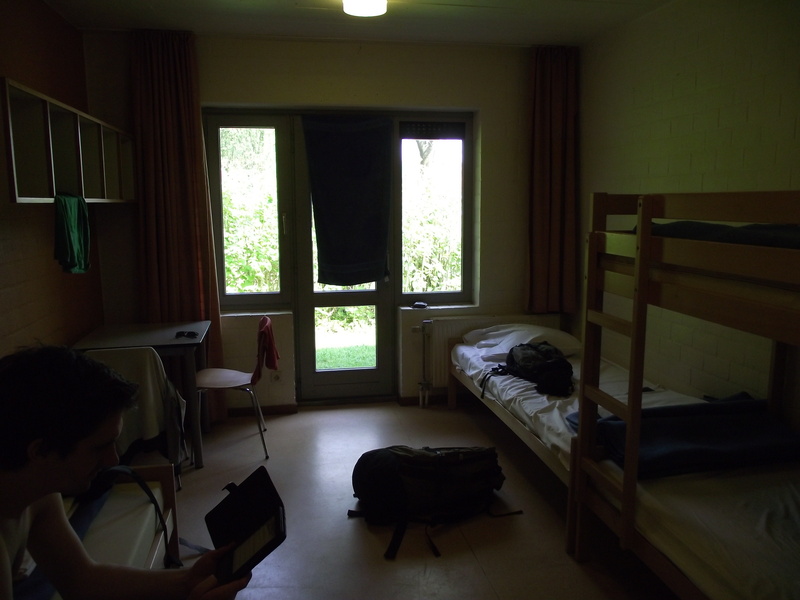 The room was pleasant, much cooler and quieter than in Brussels and offered the hope of a good night’s sleep. We nearly made our first friend when we arrived. A young man, possibly called Barat, introduced himself and asked if he could tag along with us into the city. We happily accepted, but when we came to head out we could not find him and decided to head off regardless. The first stop we made in the city was to pick up a Belgian delicacy; chips and mayo, although this is rather a specialty across the Lowlands. Following on from this culinary masterpiece we wondered the streets giggling about the fact that we were literally “In Bruges”. 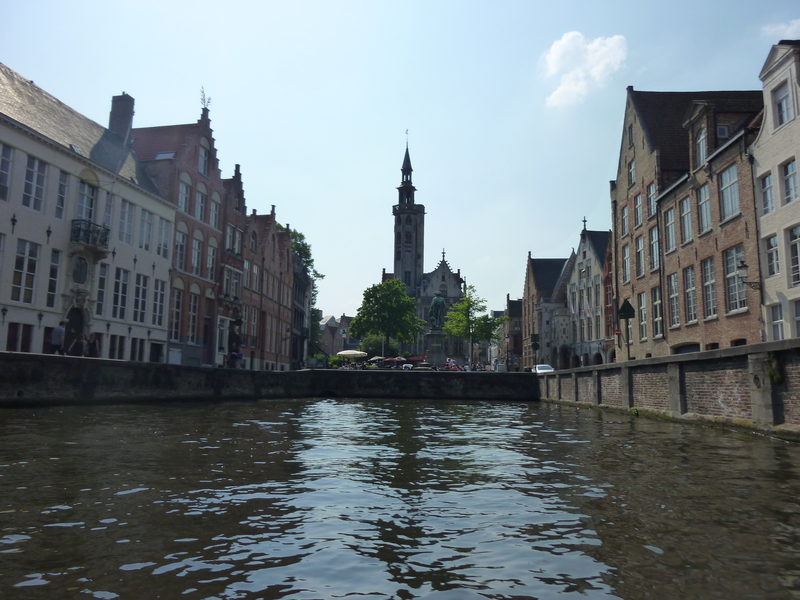 We then took a tour of the city through the canals which seemed to promise sunburn and several photos of the back of other tourist’s heads. From the water, we took a break to enjoy the city; the views, the architecture, the lack of cars, the beautiful women on bikes, before the decision was made to go on the hunt for another Belgian specialty; the waffle. Light and delicious, quite unlike those that you would find in the bakery aisle of a British supermarket. 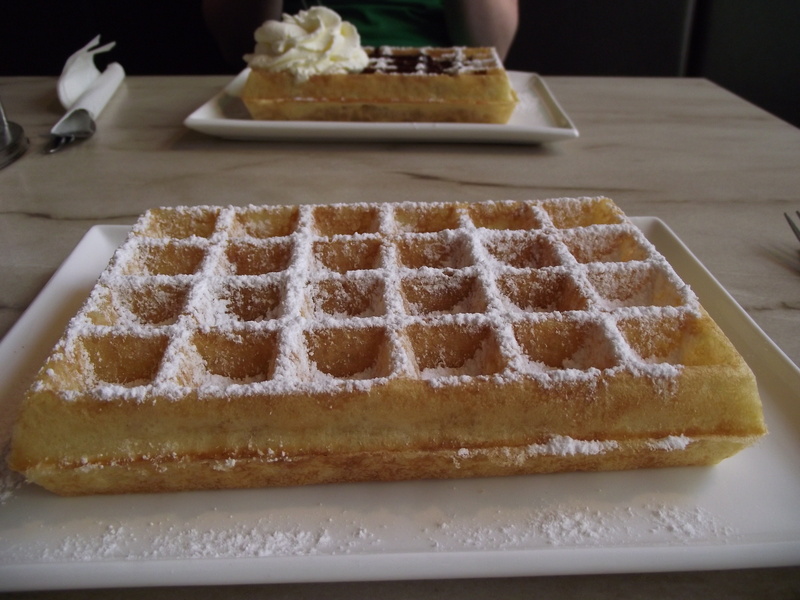 On first ordering, we had imagined that we would not need to eat again, but once finished the waffle had hardly touched the sides. 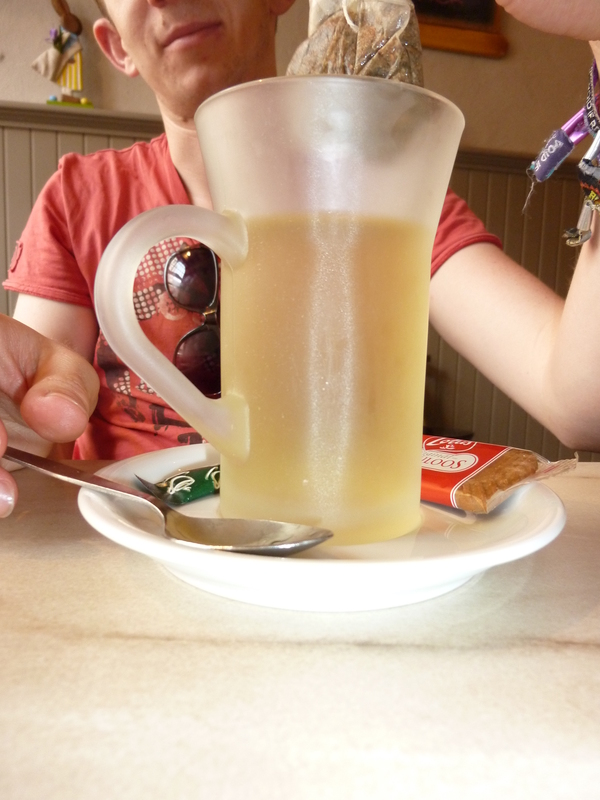 Alongside the waffle I decided that it would be criminal of me not to try a “lime-tea infusion” which didn’t taste much like lime or tea but was still rather refreshing. Something the Belgian’s excel at are tourist guides; at each hostel we had received a map which had sights, places to eat, places to drink and others all clearly marked on them, and on the map of Bruges a square was marked as having the locals’ favourite butcher and bakers, so once again the decision was made for a dinner of champions; bread, cheese and salami. This was enjoyed in a park supposedly famous, according to our map, for “frisbee and cute asses”, there was no sign of any frisbee, or anywhere that it could even be enjoyed, and very little in the way of “cute asses”. 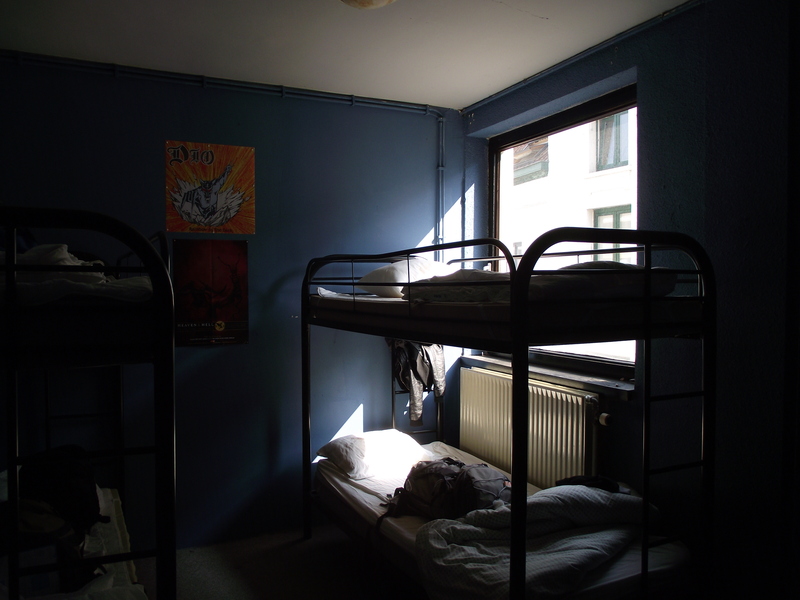 The evening was spent relaxing in the hostel room, before once again desperately trying to get some serious sleep. Another restless night was followed up with the first taste of a continental breakfast. Being a big fan of breakfast I particularly enjoyed being able to eat bread, ham, cheese, fruit, and cereal all at the same sitting, this was enjoyed alongside my first proper cup of tea of the trip which was, unsurprisingly, better than what Cafe Nero had to offer. 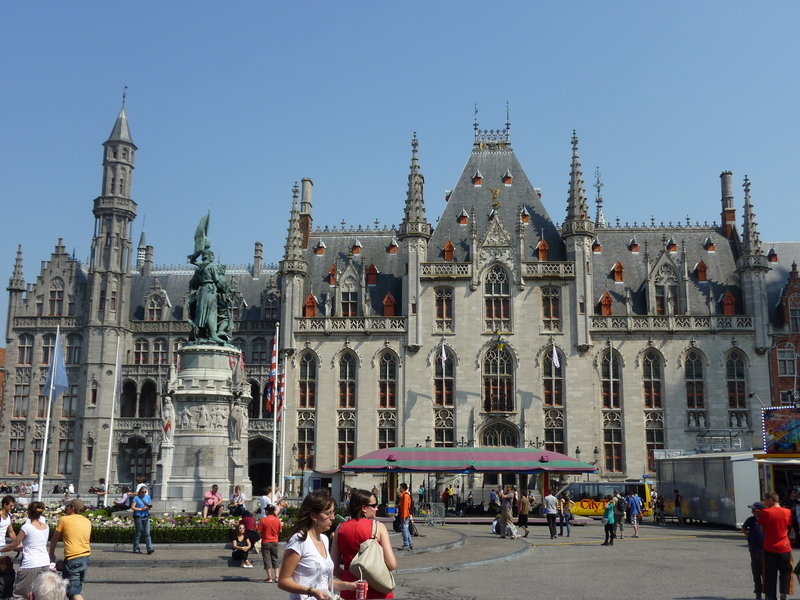 We left the hostel shortly afterwards to head off to Antwerp. At Bruges station we checked the train times, already unaware of what day it was and found ourselves on the wrong platform waiting for the wrong train. After realizing we had made such a terrible mistake, we found our way to the correct platform and the correct train. On the way to Antwerp, David filled me in with the story of how the city was named. A giant demanded money for people to cross the river and if they didn’t pay up he would cut off their hand. After many years of this, the people got pretty annoyed at having their hands cut off and so one man, Brabo, decides to cut off the giant’s hand and throws it away. Throwing away a hand translates to something like ‘hand werpen’, or Antwerpen. 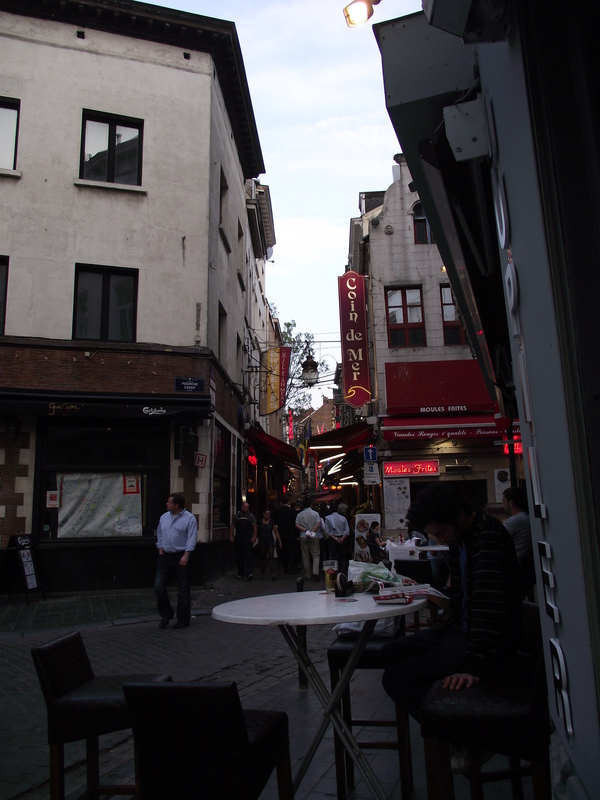 We arrived to find our hostel, De Rots, above a metal pub. This led me to spend most of the day assuming I was going to be killed in my sleep for pretending to be incredibly indie. 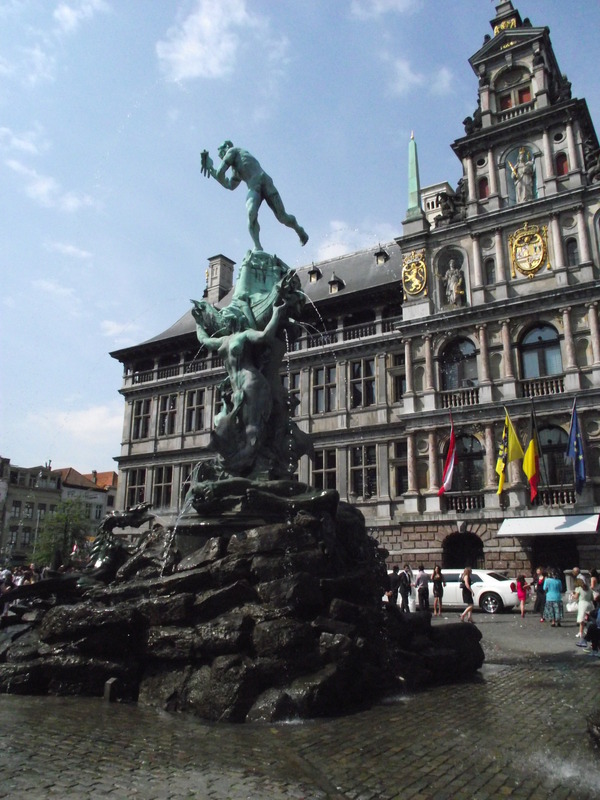 From the hostel, we walked into the city to find the statue of the giant, we find it almost immediately outside the hostel and then decide to head towards the river Schelde. Along the river were raised walkways which give an interesting view of the another abstract skyline. The Belgians have no problem with placing a hideous concrete apartment next to a wonder of Art-Nouveau. We decided to stop for lunch under what could easily be described as Belgium’s largest cathedral. It was time to try out some more Belgian delicacies; David had the trout, which he claimed to be perfectly cooked and I ordered a beef casserole cooked in an unnamed brown beer which was satisfying to say the least. At this point we confirmed that the second rule of Belgium is that to become a waitress you must be unreasonably attractive. Despite my earlier worries I found that Antwerp is incredibly hip, there is even a street dedicated to hipsters with vintage stores and independent clothing outlets, this also explained to me why everyone in Antwerp looked so effortlessly cool. 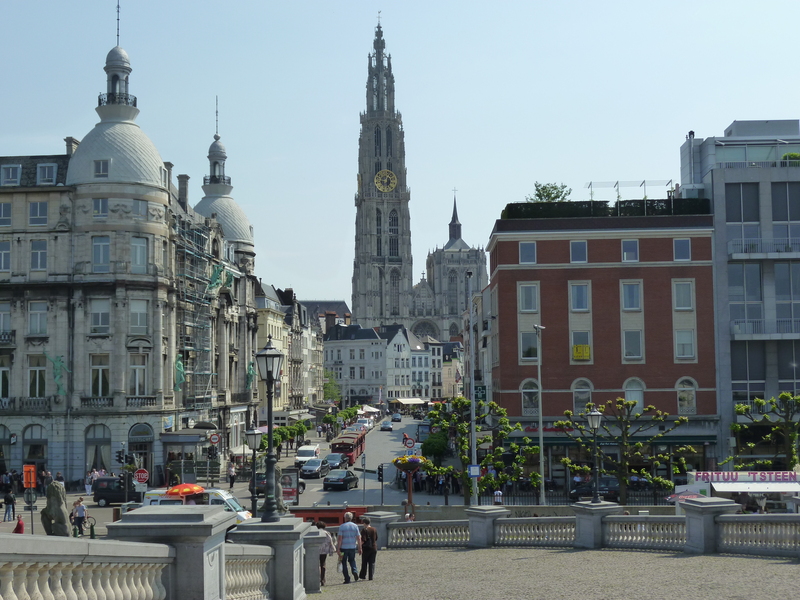 If you think you’re hip, and you’ve not been to Antwerp; think again. Much of the afternoon is spent avoiding the sun before finding a supermarket to once again indulge in a dinner of bread, ham and cheese. After chilling by the river, we head back to the hostel and decide to brave the metal-heads and sample some traditional Belgian beers. The barman first recommends a 10% ale that was called something aggressive like ‘Red Dragon’ or ‘Red Viper’, you could taste the hangover brewing and from there David and I continued to get smashed.